“Hyper Stealth Frame” exceeds the performance of previous Super Stealth frame. Bold white HKS logo printed on black anodized back plate accentuates the engine bay! The outer edge of the funnel is securely fixed to the aluminum back plate. Use of aluminum significantly improves rigidity and durability. Alumite process improves surface of the funnel and also provides a sleek black look. Ambient exposure type air clearner has larger area of induction inlet that increases intake air volume. Engine horsepower and torque become higher than a stock repiacement type. Without air clearner box, sporty intake sound is created. Free layout and larger inlet area will increase performance of engine. Fits flexibly to aluminum back plate, securely fixes hyper stealth frame. It also serves as a guide for attaching the filter to the hemispherical surface, improving maintainability such as filter replacement. The 3-layer dry-type polyurethane filter provides high air intake efficiency, dust filtration, and long product life. The cross section of the inner frame is streamlined with 16 frames parabolically placed towards the center. 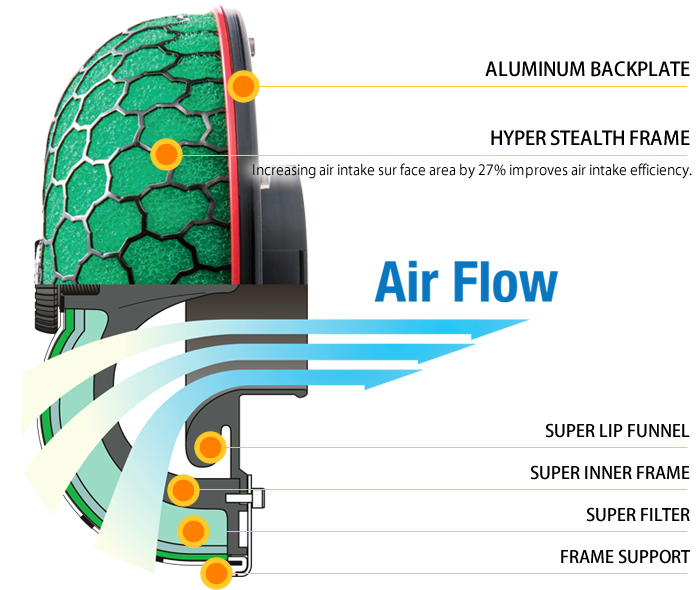 Simple lightweight frame design provides smoother air flow. The defining feature of HKS intake: “Super Lip Funnel”. Super Lip Funnel maximizes air intake surface area in the limited space in the engine bay and optimizes air intake efficiency.